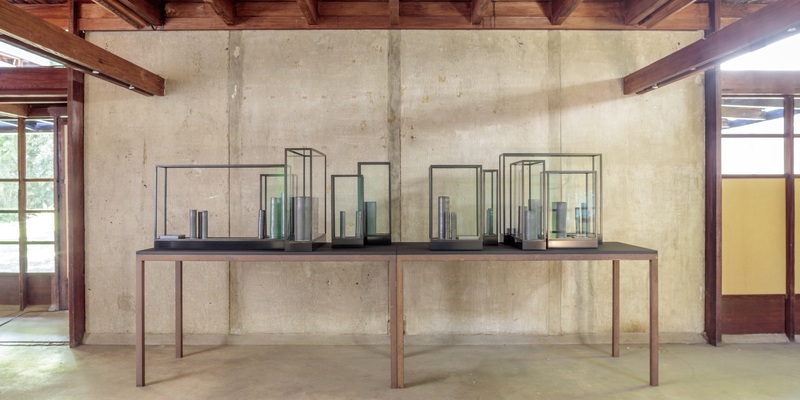 View of “Edmund de Waal,” 2018. Schindler House. West Hollywood. Photo: Joshua White. Courtesy of Gagosian. Writer and artist Edmund de Waal creates delicate porcelain vessels decisively arranged in meditative metal displays evocative of the conceptual intersection of Minimalist sculpture and modern craft. His work is currently on view in “the poems of our climate,” at Gagosian in San Francisco through December 8, 2018, and in “one way or other,” his first architectural intervention in the United States at the MAK Center for Art and Architecture, Schindler House in West Hollywood, California, through January 6, 2018, which he discusses below. I’VE BEEN OBSESSING about the Schindler HouseI’ve had a postcard of it up on my studio wall for about thirty years now. The Schindler House is this experimental, severe, and pared-back place for living and making. Rudolph Schindler, the Viennese emigré modernist, tries out both ways of constructing in extraordinary and innovative ways. The Schindler House is an attempt at rethinking living and making, and then you roll into that the fact that he’s Viennese and an émigré, that’s all part of my DNA. Why wouldn’t I want to have a go at playing in the Schindler House? “one way or other” features installations as well as my work with ceramic, porcelain, and other materials, including steel, and gold. It will include a new text work in the form of a table, a brand new way of using liquid porcelain slip on a flat surface where I’ve written through, inscribed, scraffitoed through to reveal gold beneath. The house is full of shadowsthe house itself is a weirdly beautiful, sensitive meditation on how light worksso I’ve used a lot of gold to create different auras and reflections, my table alludes to Schindler’s absolute detestation of the Secession Building, which is the apotheosis of gold. So, there’s a conversation with Schindler across one hundred years about why gold matters. The show at the Schindler House includes two commissioned pieces of music. One is a beautiful and very short abrasive piece of music by Anton Webern, the great, tough, Viennese experimental composer. He composed these bits of music at the same time that Schindler was building the house, bits of cello and piano, and that’s going to be played at random intervals during the day. For the other musical arrangement, I’ve commissioned and worked with the artist Simon Fisher-Turner. Simon is an experimental composer who worked most famously with Derek Jarman. We recorded in different houses and spaces in Vienna that Schindler absolutely hated. He was a great hater. It’s one of the questions: whether he escaped Vienna, or Vienna escaped him. Schindler hated the Secession building because it’s gold and louche and bourgeoisso we recorded there under our coats. Simon and I spent a good few days going around to all the places that Schindler studied, the different schools. We kind of broke into various places in the city, recording ourselves slamming doors and walking down corridors. Just enormous fun. We felt like teenagers, as you do in Vienna if you’re anything creative (but that’s another story). We tried to trap some of the reasons that he might want to leave Vienna and start again. That’s brought into conjunction with the acoustics of my studio, and the sounds of making stuff here in London, and also Cagean bits of silence, remembering of course that Schindler House was a place that John Cage loved and lived in. I dropped things and recorded silences, sounds of me making. I’m trying to use the whole house as a site for trying out new things, which is what I think it was meant for. Schindler demands a fierce, strong, interlocutor. It’s a house that would just give up on you if you tried to be tasteful. It would look back on you and go, “You’ve failed.” It’s not about taste at all. It’s about a fierce beauty: a fierce, interrogative beauty. I take this stuff seriously. I take the whole idea of being an émigré, of leaving somewhere and going somewhere else and starting again, really seriously. The provenance demanded a kind of attention.